About Us | Lunker's Guide | Fishing Reports Maps and More! Hello and welcome to The Lunker’s Guide. My name is John W. J. Snyder founder and owner of The Lunker’s Guide. 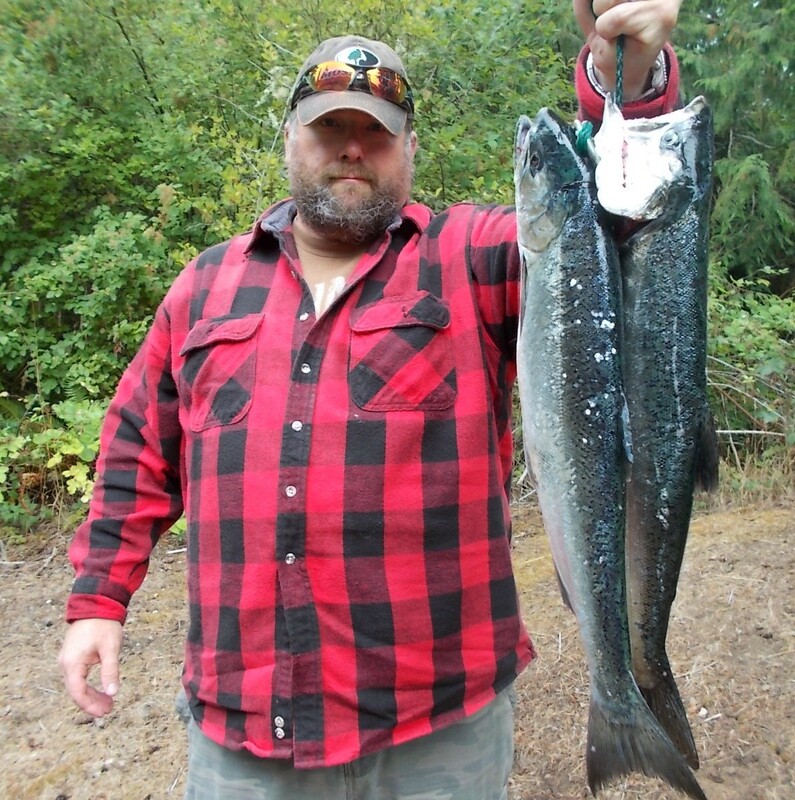 As a local Washington native I have fished Northwest area waters since I was 7 years old. Inspired by my grandfather (Bill) Merrill Van Allen Snyder the greatest angler I have ever known. I have developed a passion or obsession for the sport. 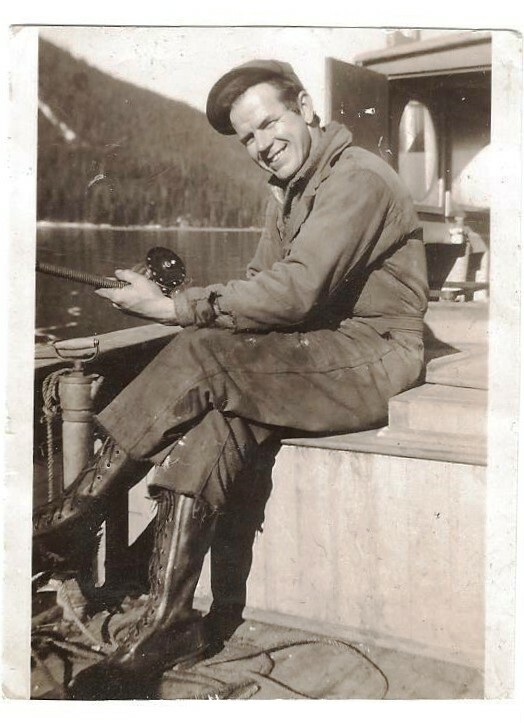 My grandfather was renowned for being the first to catch a steelhead every season opener on the Skykomish river. 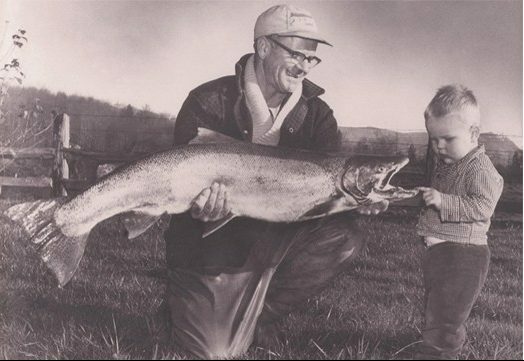 The banner photo you see on this site is of my grandfather with a 22lb steelhead he caught on the Skykomish and my cousin (Mike) who is also an avid angler. Now, I was born here in Washington state, but long ago, I left Washington to find my way in the world. Throughout my many travels I never forgot the great times I used to have fishing with my grandfather here in Washington. Later when I returned to Washington, I found that many of the old fishing holes had changed and I was having a hard time finding good walk on fishing access, even on the Washington Department Fish and Wildlife website. I found the WDFW site to be a somewhat overwhelming mass of information that was convoluted, not user friendly and more geared towards boaters. Also I found that the WDFW website provided very little information on public fishing access for Washington’s many rivers and streams. This was a bit disappointing, but as with any true angler this only made me even more determined to find the great fishing spots of Washington State. This is when I set out on the journey to find the best salmon and steelhead fishing locations that offer bank fishing access. Many of those locations include boat launches for boaters as well. 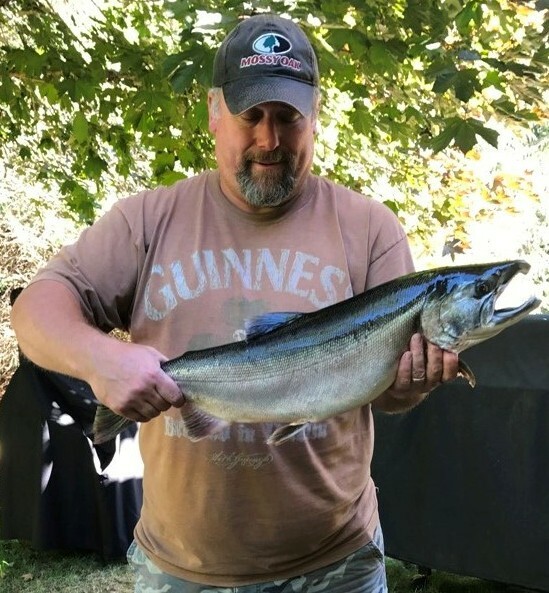 After years of navigating and mapping out all the best salmon and steelhead fishing locations in the state, I decided I wanted to share my many years of knowledge with fellow Washington anglers and those looking to get into fishing for Salmon and Steelhead. This is when I came up with the idea for the ultimate salmon and steelhead fishing website that would not only show anglers where those fishing holes are but let them know when they need to be there. As a result Lunkersguide.com was born. As you can imagine this website was inspired by a passion for Salmon fishing and the never ending desire to find the ultimate fishing hole. The problem is the best holes are hard to find, this is why we at Lunker’s Guide have created over a almost three hundred Lunker location maps! These maps offer the exact fishing access location for every body of water found on our site covering the northwest and west coast from Alaska to California. Next we decided to call our website Lunker’s guide because a Lunker is a term used to describe a big fish. Some of the biggest fish in our area of course are Salmon and Steelhead and Washington has some of the best Salmon and steelhead fishing in the country. Also as a meat gatherer it’s important to remember, the bigger the fish the more meat for the freezer and well worth the fight. If you don’t to eat fish that’s ok too! but If you’re like me you love to eat salmon, and if it’s smoked, all the better. Also since I have a background in Telecommunications, I wanted to offer a way we could alert anglers as to when salmon or steelhead were running on a specific body of water, season openers and other critical information like early closure or rule changes. This is how we came up with “Lunker Alerts!” Lunker Alerts is a text message alert system that sends Lunker’s Guide members vital information straight to their cell phones. We also decided to make it free to all of our members rather that charge a separate fee. This way Lunkersguide.com users can get more value for their membership. Here at Lunker’s guide were not just about showing people all the great fishing destinations in Alaska, Washington, Oregon and California, we also strongly believe in conservation and strive to preserve fishing opportunities for future generations. For all those who use our site, we ask that you use environmental stewardship when on the water and to be an example for other angler’s whom might not know how to fish responsibly. Thank you for checking out our website, we hope you enjoy it. If you have any questions about the Lunker’s Guide or our services please go to our contact page and drop us a line.